This shocking video shows a jealous woman laying into her cheating partner and his other lover after discovering them together at a cafe. 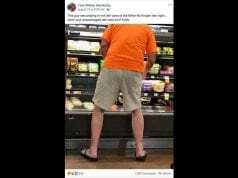 The video has gone viral on social media, being watched more than 40 million times. 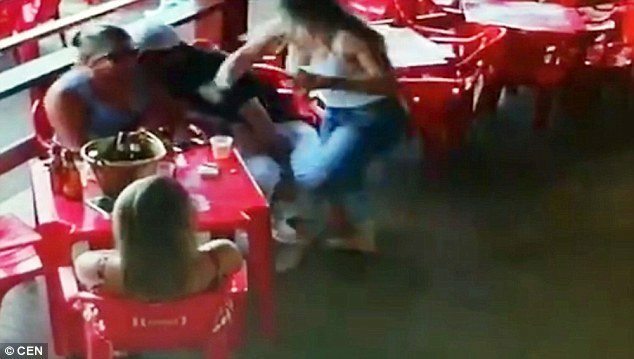 It shows a brunette woman storming up to a man in a cafe somewhere in Brazil, who is chatting with a blonde and another woman. Without any warning, the brunette punches the man in the side of the head and grabs the blonde’s hair, dragging her to the floor. The man falls on top of the blonde and the brunette grabs his wrist and helps him up so she can continue her attack. 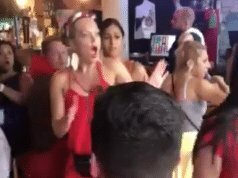 They scuffle off camera for a few seconds and the blonde stands and arms herself with one of the cafe’s red plastic chairs, thinking she will soon have to defend herself. The man is struggling to calm down the brunette, thought to be his wronged girlfriend. The escalating scuffle disappears off camera for a short while and then the man appears again, this time taking a beating from the irate blonde before she storms away. None of the people in the video were identified, though it is thought the man is either married to or in a relationship with the brunette, who had discovered his adultery with the blonde. The video has so far gotten more than 52,000 comments. ‘Gisele Coelho Pedrosa Gisele Pedrosa’ wrote: ‘I have never understood why [wronged women] beat lovers and then get back with the husbands. If I were in that position, I would beat him, and only him’.